... from my (Melbourne) back yard to the post office. First I was dazzled by the purple native hibiscus (?) 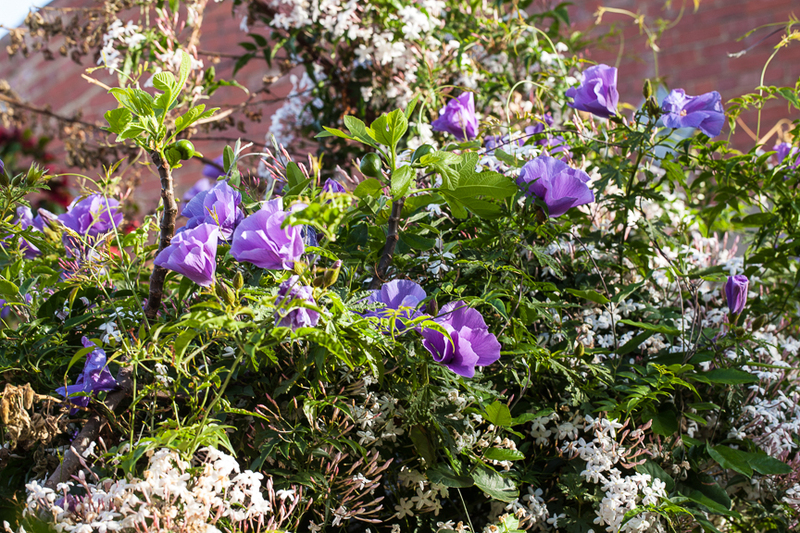 dancing along the side fence with the Jasmine. 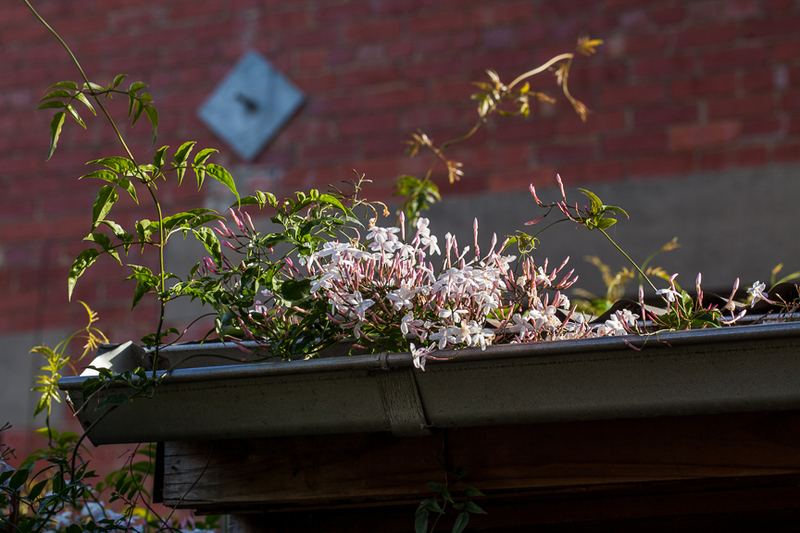 Then I noticed the Jasmine in the gutter and something about it reminded me of a young child sitting, playing on the edge of a footpath, feet dangling in the gutter. And then I was struck by the everyday-ness of the down pipe and how the flowers and foliage made the shapes look quite beautiful. So with gutters and pipes in my mind, I set off to the Post Office and just a couple of doors up from me I spotted these blue flowers in a front yard. And I love the old green velvet couch sitting on the porch behind the flowers. Can anyone let me know what the flowers are called? I was keeping an eye out for details and spotted these tiny flowers that are quite possibly a pest because they seem to be everywhere (more photos of them further down). But I did like the rusty gate and cobwebs with just the hint of greenery. Just across the road from the Post Office I fell in love with this Wisteria. I was so blinded by its beauty it wasn't until I looked at the photos that I saw the intricate details in the house supporting it. The sun and shade worked nicely to accentuate the yellow bush against the rust coloured gate. The colourful wrought iron fences and gates and the fancy (filigree?) trimmings on the houses make great subjects to photograph. I love the colour contrast once again (below), this time with the purple (Iris? Help me out here, please) peeping through the repetition of the pale green fence rungs. The shadows, shapes and lines caught my eye above and below. As I mentioned, the plant below is probably a menace because it creeps everywhere, but the flowers are quite beautiful, albeit tiny. A lot of character in a small space. I love the contrast of the shapes between the straight lines of the old chair and the round wheels of the bike and the repetition of the fence. Not to mention the incongruitey of the chair just sitting there. There's so much to delight in with bright, bold Nasturtiums poking through chain link fences and delicate, pale yellow (don't know the name) flowers growing in a window box. 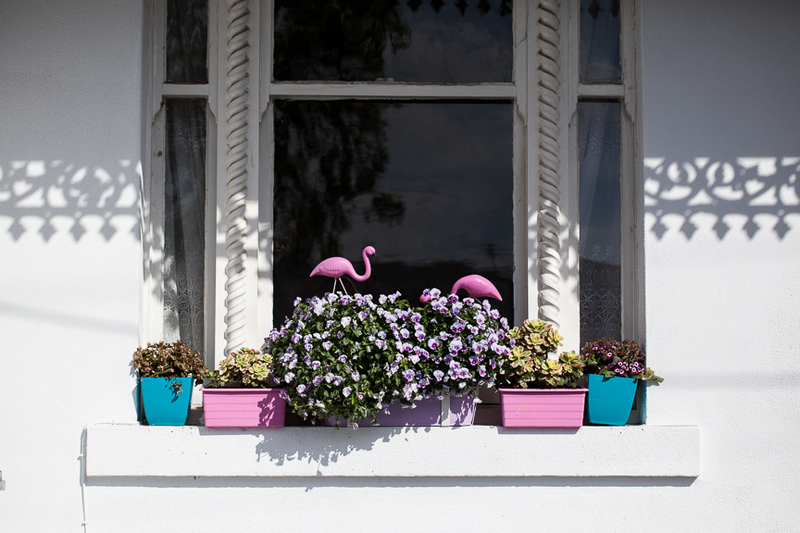 You simply can't walk past a pair of pink flamingoes and not take a photo. I love the symmetry in this shot and the shadow of the lace work to balance it. 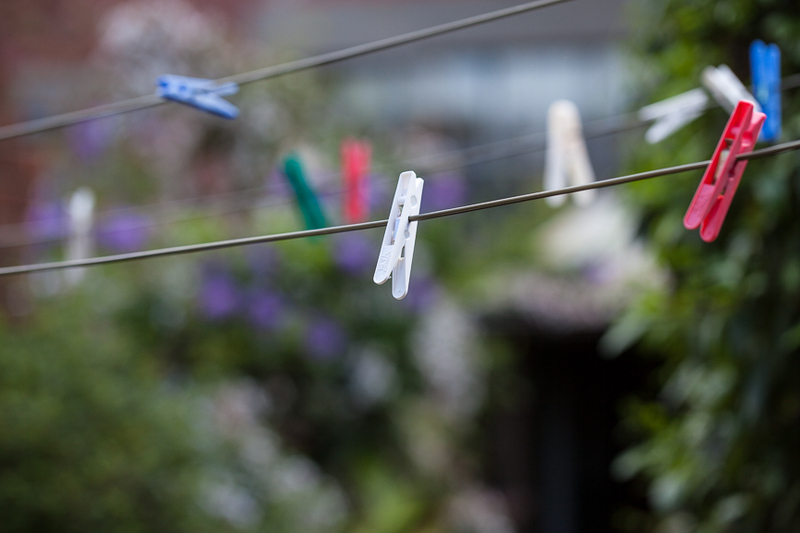 And then back home and to finish off where I started, in the back yard with the pipes and gutters and jasmine and hibiscus, with an every day shot of pegs on the clothesline.